Eagles have been used as national symbols by Egyptians, Romans, Americans... and fittingly. Soaring bald eagles stir us to look heavenward. America almost lost this symbol. Only diligent conservation and powerful parenting practices saved our majestic bald eagles. Surviving eaglets can give credit to their parents' skills. Let's look at the parenting techniques of America's greatest bird and see how they prepare the young to soar in the real world, and how we can do the same. Bald eagles nest atop the highest trees. Mom shades her eaglets while she's there, and piles up sticks and debris for shade while hunting. Bringing an evergreen branch to the nest with each breeding cycle may be an effort to provide additional shade (Ez.17:3-4). Homes need to be safe havens for children. Young people today often seek safety-a place to escape the heat of society and often their own homes-in gangs or disreputable peer groups. I ache for children unable to take secure cover under mom and dad's protective wings. Provide your child's favorite shelter in your home. Expect thanks later. Bald eagles mate for life. Like an "old married couple," the male may push the female out of the nest to give her a break from warming eggs. Train children to have successful, permanent marriages by example. So what if the relationship gets a little peculiar through the years? I've never met a young person who would swap his parents' worn-slipper relationship for a divorce. Children need to know love works. With God's help, marriages can be repaired. Give kids courage to try to love themselves. Reassure your children that their parents will always be there-together. The female bald eagle lays two or three eggs. The first hatched is always largest and a fierce food competition begins. But each eaglet is fed according to its need and appetite. Every youngster is different. So they're raised differently-a principle for wise parents. Swindoll suggests we're to train each child in the way he individually should go (Prov. 22:6). The way he can walk with self-confidence for a lifetime. Children are different and must be raised accordingly. God's unique creations-each child has a distinct purpose in God's plan (Psalm 139:13-16). Wise parents feed their children instructions on an individual basis according to knowledge and need. Mom and dad teach young eagles to fly solo by flying back and forth in front of the nest with food. Hunger forces the eaglets to reach out for it. Leaping from the nest, they flutter to the ground. Rewarded with enough food for strength, the lessons continue. Parents often fear a child's anger and won't stretch him beyond his comfort zone. Those children stay weak like muscles that aren't exercised. God tests and stretches His adult children so we learn to walk by faith (Exodus 20:20). Stretch your children. They may get angry, but later they'll be more upset if you don't. Once young eagles learn the basics of flying, it's time to "soar like an eagle!" Leading the young to lofty heights, a parent provides lift in his powerful wake. Did Moses observe this? As an eagle stirs up its nest, hovers over its young, spreading out its wings, taking them up, carrying them on its wings (Deut. 32:11). Every child needs a lift. A hug can send 'em back into the game. "Find the good and applaud it!" (Zig Ziglar). Lifting up a child takes a parent who is plowing through his problems, making a way for his children to follow. Few children learn to soar any higher than their parents (John 13:16). Set the pace. Lead your children to heights they can't reach on their own. Eagles are diligent parents and distinguished emblems for America. Teach the young residents of your nest to soar in the real world: Those who wait on the Lord shall renew their strength; they shall mount up with wings like eagles, they shall run and not be weary, they shall walk and not faint (Isaiah 40:31). 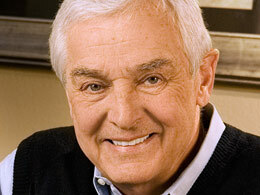 This article was excerpted from Turning Points, Dr. David Jeremiah's devotional magazine. Call Turning Point at 1-800-947-1993 for your complimentary copy of Turning Points.